I have been trying lately to spend more time with my sketchbook journal. While journaling is not new to me a journal with pictures is. I'm finding the experience both exhilarating and intimidating. On the one hand I'm enjoying the freedom to record observations and make quick studies of various plants, animals and birds that capture my attention without having to create a whole finished painting. I love the spontaneity. The combination of words and pictures, color notes, weather conditions, etc. 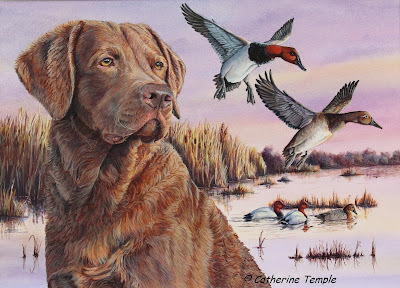 give me much more information when it comes time to create a completed painting. The journals are also nice because I can do a small thumbnail sketch in different media until I find what works best instead of starting a larger painting and not liking how it's going and have to start over. The flip side to all this is that I am a detail-oriented perfectionist and so the sketchbook journals intimidate me because I try to make myself work quickly and loosely. That spontaneity I love also makes me feel like I'm out of control! I seem to think I have to create a beautiful, perfect painting every time I look at a blank page. It runs through my mind that someone might see these unfinished, imperfect sketches and think, "My gosh! This woman calls herself an artist?!" This is silly, I know because no one ever has to see them unless I choose to share. So this is my struggle, but it's also a good learning experience. It's good to stretch and grow and try new things. The peregrine was done in gouache which is a medium I haven't used for quite a while now and never one that I've sketched with. I tried to let myself play, keep it loose and sketchy. It's a little messy compared to my usual style, but you know what? I really kind of like it! Female Kestrel-acrylic 5" x 7"
I seem to really be stuck on this kestrel theme lately and have created two more paintings of them. 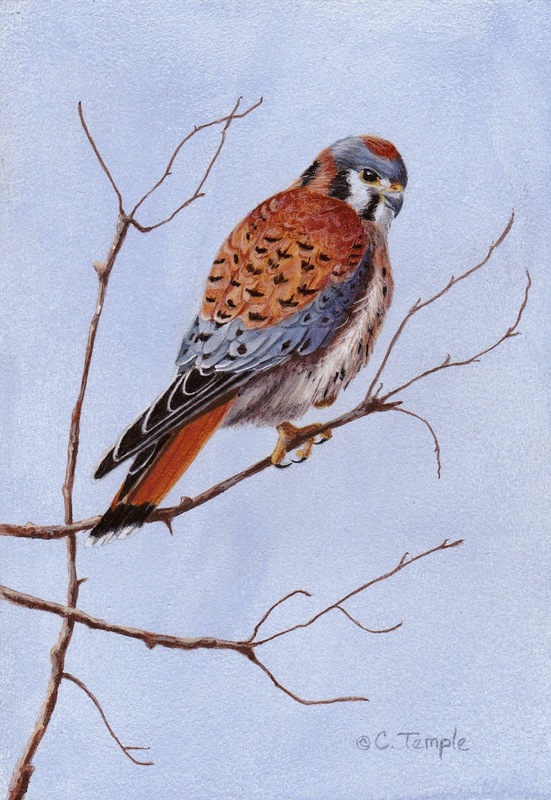 Male Kestrel- acrylic 5" x 7"
These are separate paintings depicting a male and a female and may be purchased as a pair or would also make a nice individual piece. 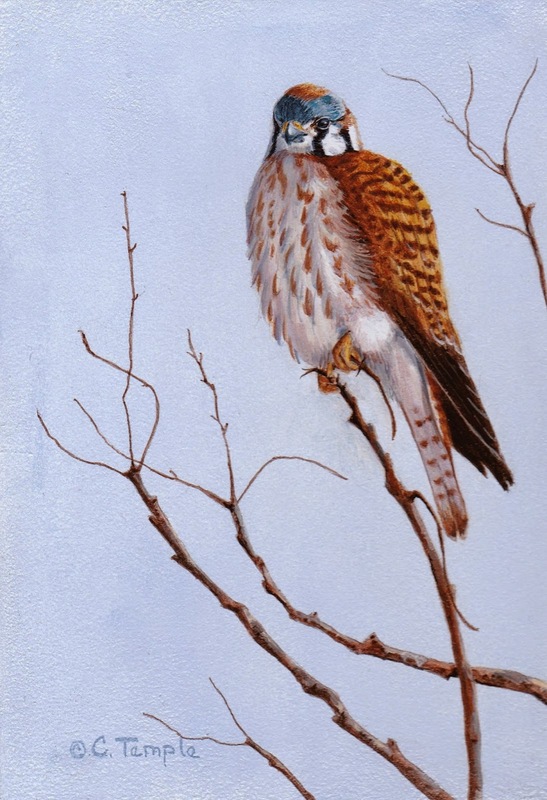 I am hoping to continue this series and have ideas for at least a few more paintings featuring American kestrels. 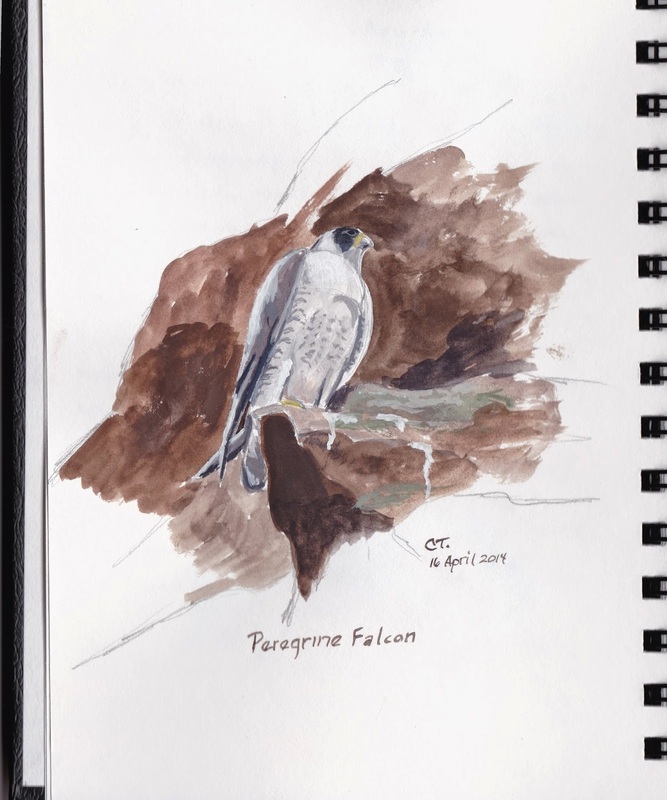 I have found a couple of nesting pairs this spring and hope to follow them through the nesting season taking photos and making sketches. Sometimes it's nice to study your subject in depth instead of just creating an artwork and moving on. There is so much to learn and I think it helps you to grow as an artist by slowing down and really observing your subject. These two paintings are available directly from me or may be purchased through my Daily Paintworks gallery. They are $125.00 each or $200.00 for the pair. Stay tuned and see what I come up with next!